With SHELL OIL moving north any day now to extract oil from the Chukchi Sea, child Ambassadors for Climate Justice plan to host an informal press conference on Wednesday near the Pacific Science Center and Space Needle to ask grownups, the SHELL CEO, and world leaders to protect the Arctic immediately. They will read a letter to the SHELL CEO composed by youth on three continents and co-signed by students from 23 countries. Then each child attending will be invited to make a statement of concerns and solutions for the Arctic drilling plan. “We need world leaders to lead but locally we make a big difference too. If enough of us show up to say ‘SHELLNO’ and get really creative, only then can leaders do anything. The Arctic belongs to all of us. We can still protect it if we care enough. We’ve got some really good ideas,” said Wren Wagenbach, 14, leader of the local chapter. 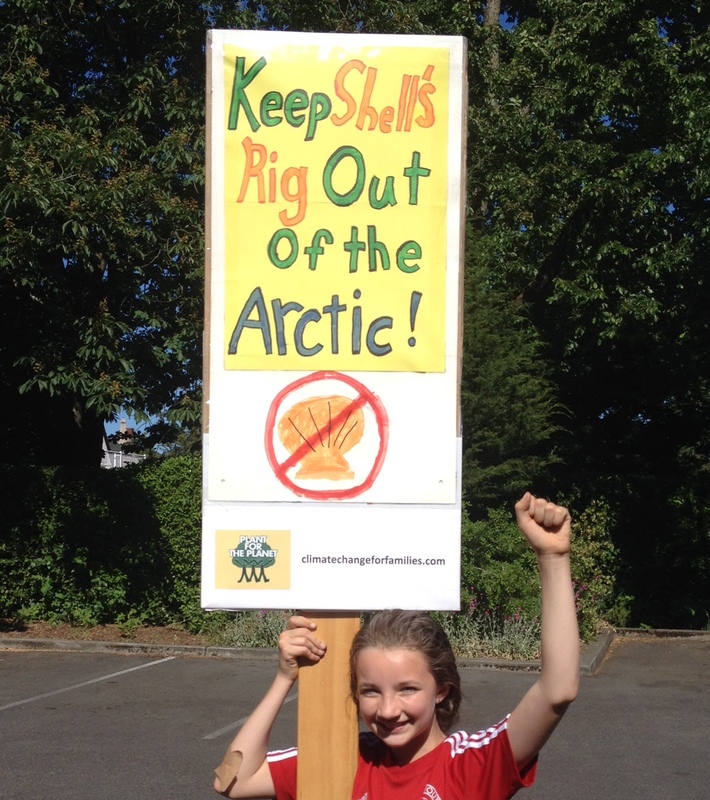 Wren took part in the kayak Mosquito Fleet protest in May with her father who helped her paddle over from Ballard. Students planted trees with Port of Seattle Commissioner Gregoire in March near port terminal 5. “Those trees will be swallowed by the Sound if this drilling plan goes ahead. Everybody admits there’s a 75% chance of an oil spill nobody can clean up. As a parent, I can’t stand by and watch my daughter’s world be ruined just so we can burn more and more oil,” said Michael Foster, organizer/volunteer with Plant-for-the-Planet. 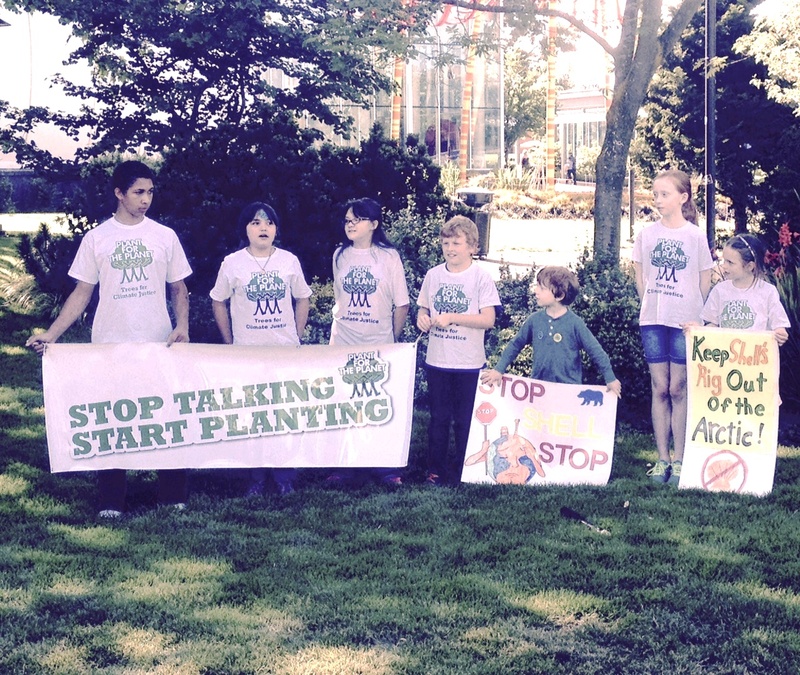 Plant-for-the-Planet in Puget Sound has helped over 300 youth join a global network of children working for Climate Justice. Plant-for-the-Planet International runs the United Nations’ Tree Counter, now showing 14 Billion Trees planted, with a goal of 1,000 Billion as part of a 3-Point Plan to restore climate balance and end poverty. In February Readers’ Digest magazine honored Plant-for-the-Planet founder Felix Finkbeiner as “European of the Year”. Two Seattle students journeyed to a Youth Summit in May to work with Felix on a Youth Manifesto to protect the world’s children from climate chaos. On Tuesday June 9th, HBO debuts a new episode of “Saving My Tomorrow” which features some of the students from Seattle Plant-for-the-Planet in a documentary about children doing heroic things to heal the planet. Posted on June 9, 2015 February 12, 2016 by Dr. Baba Kofi WeusijanaPosted in Local Events, Plant for the Planet NewsTagged press release. Thanks to the following Climate Justice Ambassadors that spoke from the heart on 6-10-15 about keeping Shell out of the Arctic, by coming out to our First Ever P4tP Press Conference (from left to right, on top picture): Aji, Sarah, Lara, Tim, Wren, Bodhi, Sierra, and Athena!